Hey look, there's two caches in that picture! 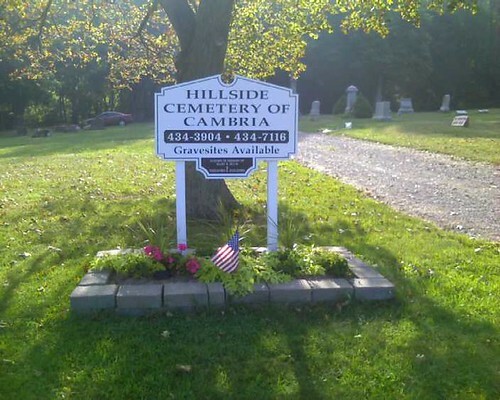 I've been admiring Hillside Cemetery in Cambria, NY, located halfway up (or down) the Niagara Escarpment as a potential cache placement location for years. But I was really never interested in inviting 100 people a year to this rarely visited burial ground on Geocaching.com. With the low traffic associated with an OCUS cache, I became more interested in my idea, and with the advent of BITcaching, I finally pulled the trigger in August, 2011. You are looking for a BITcache, i.e. a Bound ID Tag, not too far into the "woods". More information is available at www.bitcaching.com Also, there is an example of what a BITcache looks like below. Enjoy your visit to this historical burial ground. No night caching, of course. And as someone who has been "watching" this cemetery for years, I can tell you there is absolutely NO WINTER MAINTENANCE whatsoever, and you would have to park on the side of the road (if you feel comfortable doing so) and tromp through the snow, if caching in the winter. And the Niagara Escarpment is one cold place in the winter. Obhaq gnt, unatvat va n gerr, bs pbhefr. Hidden over two years ago, not found in over a year. But I'll tell you what, this BIT Cache is in pristine condition. It's under tree cover, but I'm still totally shocked at how brand new looking it is. Back in the day, I had them printed at Kinkos (and it's much larger than my newer BIT Caches, probably double the size), and I had them machine laminated there at Kinkos too. Come and get it! 3413. Stopped by here on may way from Lockwood to Niagara area. No one was around and I was able to leave my car and make the find in just a few minutes. By golly, I thought for sure I'd be the first one here. Busy place today. I wasn't sure what size cache I was looking for, but I spotted it from a short distance after maybe a 10 minute search. My GPS read 15' at GZ. I visited this cemetery about 10 years ago while conducting genealogy research. It was nice to make a return visit today. Thanks!